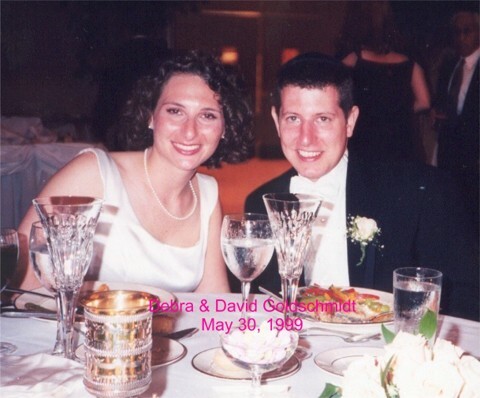 On May 30, 1999, Debra Goldsmith, daughter of Jeffrey and Roberta Goldsmith married David Goldschmidt at Congregation Kneseth Israel. This photo was taken in the Alan J. Reiter auditorium of the synagogue, which looked like a five star hotel that night. The annual Rabbi Rosenblatt Lecture takes place in June of each year, coinciding with the yahrzeit of Rabbi Morris D. Rosenblatt. In 2000, Rabbi Joseph Teluskin was the guest lecturer. Other prominent speakers at the Rosenblatt Lecture over the years include Elie Wiesel, Shoshanna Cardin, and Rabbi Shlomo Riskin. Aaron Schmerling is called to the Torah for the first time in his life on Thursday, September 6, 2001. His Bar Mitzvah was that Shabbos on September 8. Photo taken in the Israel and Sarah Legum Chapel. Torah reader is Eliot Bulman, a devoted supporter of the daily minyon at Congregation Kneseth Israel.